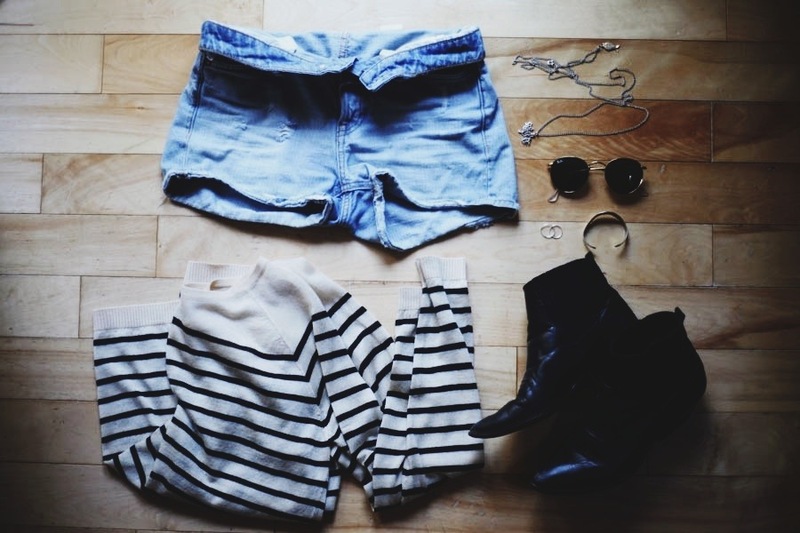 I love photos of clothes layed out. Is that a strange thing to like? maybe.. But, since I like it I figured I would start doing some photos of my “threads” every so often. This is a summer staple outfit for me; denim shorts (which now get rolled so that baby has some room), black boots, ray bans, delicate jewelry- I wear these things everyday, I love jewelry that you dont have to take off, you can sleep in it, swim in it, wear it fancy or casual… these are those pieces for me, and a baggy sweater. Boots- Buffalo Exchange — I got these boots when David and I were on tour with his band. We spent a day walking around Wicker Park in Chicago (one of my fav places!!) We went into tons of Vintage stores, and I was being very good and didn’t come close to buying anything. But when I tried on these boots there was no going back. I love me some black western booties! That isn't strange at all 🙂 I agree I love photos with my clothing laid out! This outfit is so cute and how exciting that your baby bump is starting to grow!